Our automatic Sectional Garage Doors are stylish, made to measure doors combining innovative safety and security with a wide range of surface finishes, colours and styles allowing you to create the perfect door for your home. They are supplied with remote controlled electric operation with your own personal security code for maximum security, convenience and ease of use. 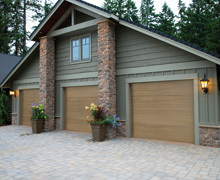 The sectional design makes the most of your driveway and garage with vertical opening which ensures you can park right up to your door and use your entire driveway. Headroom requirements are minimal with as little as 70 mm needed for our low headroom motorised operation. Subject to correct installation, maintenance and operation these carry a 7 year motor warranty. We can supply doors for your own DIY installation or you can take advantage of our UK network of professional fitters, just ring us for details. Remember, we are never knowingly beaten on price! View our prices below and if you see a better price for the same sectional garage doors showing elsewhere then please ring us - we are confident we can beat any advertised price! 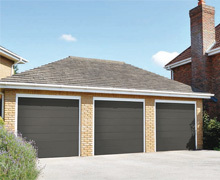 The Sectional design is a 40 mm thick insulated steel panel manufactured to the highest specification to ensure you get the most from your garage space. The security features protect your home and weather seals on all sides provide all-weather protection from wind and rain adding to the energy efficiency of your home, saving you money. 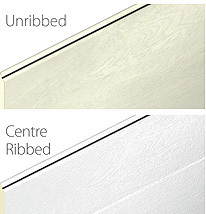 We have a choice of woodgrain embossed, a natural looking wood texture or the more modern smooth finish. 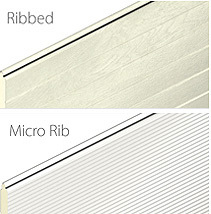 Golden Oak or Rosewood are also available in our ribbed panel designs. 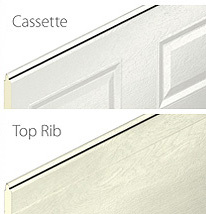 Our doors come in white as standard but the panels are available in a full range of optional RAL colours to suit the look of your home. 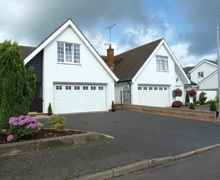 You can read more about our Sectional doors by downloading the Sectional Garage Doors brochure. Our prices are among the most competitive in the business. Select the nearest height and width to our price chart. 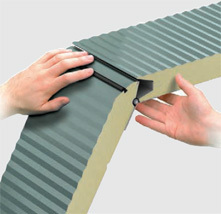 For sizes in between take the nearest higher price, for example 2254 wide by 2256 high in a standard colour = £1432 + VAT. If your size requirements are different to below we can customise to your exact measurements. Includes standard white colour finish. Guide Height measurements down left, Overall Guide Width measurements across the page (mm). 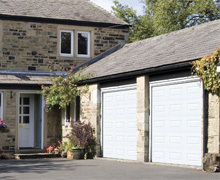 If looking to fit the sectional garage doors yourself you can download the fitting guide, for the front mounted motor (Sectional Plus) or rear mounted for low headroom (Sectional Compact) situations.